As summer falls away into autumn, I am already excited at the prospect of warming, hearty comfort foods. There is something about the cooler days that brings back memories of childhood, don’t you think? Well, for me those memories include the comforting soups that my mum used to make to defrost cold noses after chilly playtimes. 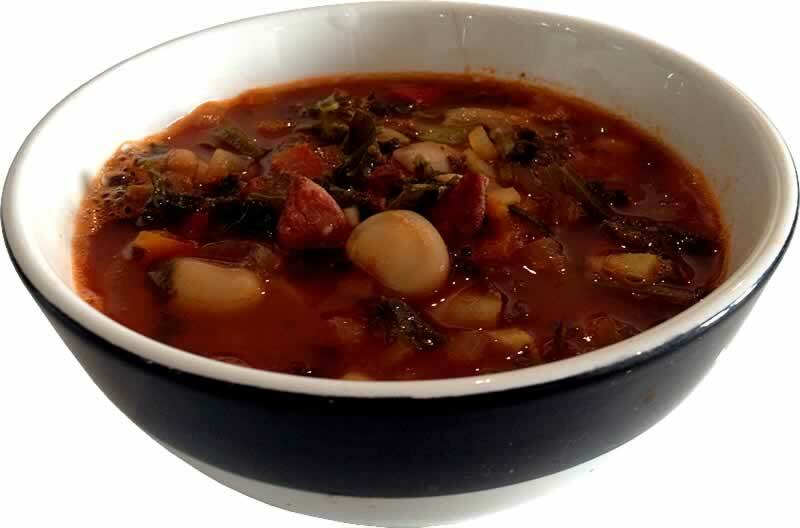 My reworking of goulash soup has replaced the potato staple with butter beans – similar in texture and just as fulfilling but nutritionally far superior. Packed with fibre, magnesium and folate, a serving of butter beans also provides more than a quarter of our daily iron needs, as well as being a source of protein and anti-oxidants. In a large saucepan, gently saute the onion, peppers, garlic and chorizo on a medium heat. You shouldn’t need any extra oil, as the oil from the chorizo will be enough. When the onions and peppers are softened, add the passata and stock and gently heat to a simmer. Add the kale and butter beans and simmer for 5 minutes before adding the courgette and simmering for a further 5 minutes until the vegetables are softened but still have some ‘bite’ to them.